Halloween is generally acknowledged to be a “fun” holiday — nothing too deep involved, a brief diversion — particularly if you have children under the age of 10. But it’s come under attack in recent decades, what with its pagan origins and rampant sugar-consumption. At the very best, it’s meaningless entertainment for children; at the worst, it’s something evil to which an alternative distraction must be found. Last Halloween, we took our three daughters trick-or-treating, with the rest of Addison County, along Middlebury’s South Street and into Chipman Park. This was the first time our two-year-old had been trick-or-treating outside of a stroller, and in her mind it was a race to the finish. It was like somebody wound her up and let her go: The minute her feet hit the sidewalk, she barreled ahead of the rest of us, sparkly shoes and Cinderella dress blurring in the twilight. It took her a while to grasp that we had to stop at each house for the ultimate goal: candy. When we got to the first house and managed to head her off toward the door, she burst right through the open door, past the baffled teenager holding the candy bowl, into the living room, where she finally skidded to a stop and looked around with confusion. Where was that candy? My daughter’s faux pas, her lack of understanding that Halloween etiquette requires stopping at each open door, got me thinking about a deeper meaning to Halloween, apart from the costumes and the candy and the pagan undertones. The really remarkable thing about Halloween, it seems to me, is thatit’s a night when we open our doors. It’s so rare that we open our doors to each other, even to those we know and love. Usually, when passing our neighbors’ houses, we see closed doors, few signs of life. But on Halloween, when the colder weather is beginning to drive us further behind closed doors, we open our doors not just to those we know and love, but to total strangers. Not only that, but we give them treats and receive very little in exchange. Sure, the occasional cute kid or clever costume make us smile, but having been on the candy-giving end, I know that often the best one can expect is a mumbled “Thanks.” Still, we keep the treats coming. It’s so seldom that we practice this kind of grace in life. And for those who are on the receiving end, it’s not just about the candy. Each open door on Halloween offers a chance for connection, with neighbors we know and neighbors we don’t. Through every doorway, we see snippets of lives a lot like ours, with pictures on the walls and the smells of food in the oven and over-stimulated children running wild. Sometimes there’s a party going on inside. Sometimes it’s quiet save for the television. Two years ago, trick-or-treating in Northern California during Game 4 of the last World Series in which the San Francisco Giants were playing, each house we visited provided us with score updates. In a world of closed doors and computer screens, the open doors of Halloween allow us to reconnect with our community, our humanity. Of course, the doors will open wider and the grace will be given even more freely during the holidays that follow Halloween. 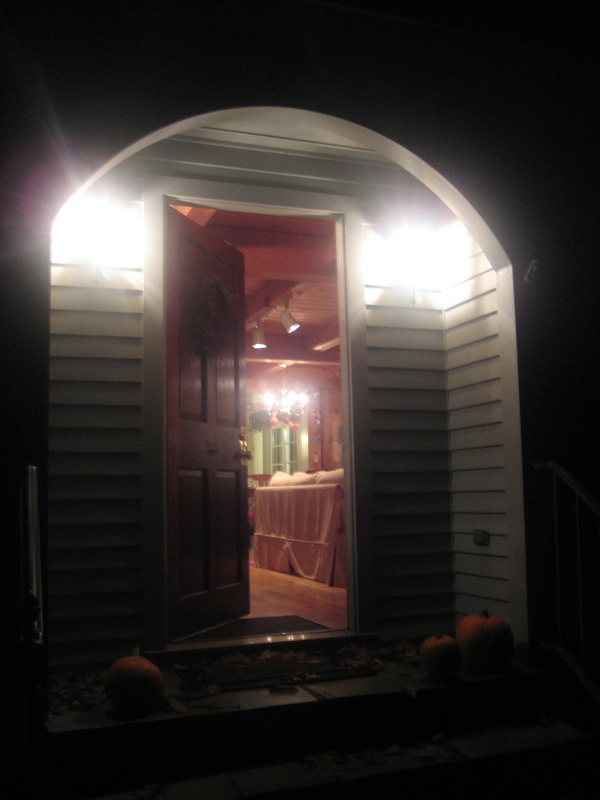 But from now on, I’m going to consider the open doors of Halloween as the official start of the holiday season. Faith Gong has worked as an elementary school teacher, a freelance photographer, and a nonprofit manager. Since moving to Addison County in 2011, her work has involved caring for a house in the woods, three young daughters, one adorable puppy — and writing for her blog, The Pickle Patch.